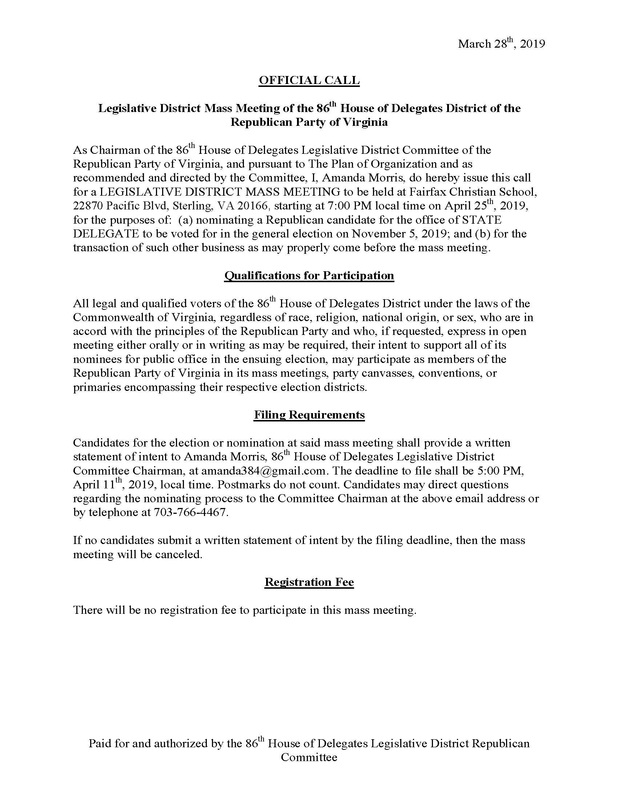 The Republican Party of Virginia's 86th Delegate District Committee will hold a mass meeting at 7:00 PM on Thursday, April 25 at the Fairfax Christian School in Dulles (22870 Pacific Boulevard). The 86th Delegate District covers parts of Fairfax County and Loudoun County. Only Republicans in the 86th Delegate District can participate in the mass meeting. Election District Offices: Algonkian, Ashburn, Blue Ridge, Broad Run, Catoctin, Dulles, Leesburg, and Sterling. Registration begins at 8:30 AM and ends at 10:00 AM. For more information and to sign up as a delegate click here.